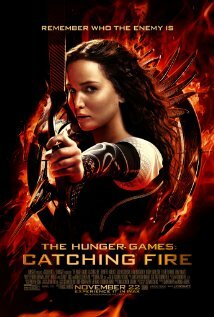 Last night a friend of mine and I saw second part of The Hunger Games franchise, Catching Fire. Note: Spoilers below! If you haven’t seen the movie yet, you might want to stop reading. But then again, it’s Katniss. You probably know the story already. Katniss Everdeen came out alive at the end of part one. She was declared winner along with her partner Peeta Mallard. She was rewarded with incredible wealth by the evil Capitol. In part one she had to hunt for her food and starve other times. With all the reward from winnings she had everything she wanted in part one and yet she continues to live the same life as part one. She lived lean, continued to hunt and did not splurge except for the new house she moved into which the Capitol gave. Staying true to her core principles helped her through the travails of second Hunger Games. Had she been relaxing and enjoying the spoils of her newfound wealth she would have been one of those to get killed early on in the movie. Entrepreneurial wisdom: I can see so much similarity to startups winning the first round by securing Series A funding. Competing hard with others with similar Apps like yours, you managed to get funding from evil VCs (like evil Capitol). That is just part one. You still have part two and part three (part four in the movie version) to go. If you stray from your lean principles, lose your agility and hustle you will be least prepared for part two. But go ahead use some of the money to move into new fancy office in the City like Katniss did. In part one Katniss was a lone wolf. She had to fight for survival on her own. In part two she could not have survived without her team. At first she was looking at the people who wanted to team up and work with her with complete suspicion. She could not trust the motives of Finnick Odair (like Twitter’s Ev could not trust Jack, or something like that). It was the sheer muscle power and ninja like skills of Finnick that saves her many times. She also wouldn’t trust the brain powers of Betee and Wiress but it turns out her hustle and grit alone were not enough. Katniss survives only because of Betee and Wiress. Entrepreneurial Wisdom: You definitely need a team to succeed. You can’t play every position as your startup grows. You should learn to hire the right skills for right jobs and trust them. At some point in your growth cycle you need someone formally trained in business, like Katniss hired Betee and Wiress you should hire MBAs to do your business development, strategy and other business stuff. Remember one thing, you should not start a company with someone you will not be competing with in The Hunger Games. There is hardly any stretch in the movie Katniss speaks. It is all action. Her action made her team believe in her and follow her as a leader. Entrepreneurial Wisdom: Don’t spend time writing speech filled with inspirational quotes. Let your actions speak. It came as a big surprise to me when Katniss discovers, with help from looney sounding Wiress, that events in the Arena follow a rhythmic pattern and repeat in sequence. The monkeys, gas, toads, etc. all repeat in cyclical pattern. Once Katniss figured it out it helped her anticipate and plan ahead for the next big one. Entrepreneurial Wisdom: Like Katniss figured out you must figure out the cyclical pattern events follow in your business. Everything in business has a pattern to it. If you find out before others and prepare ahead you get to stay alive and win in the end. Everywhere Katniss goes she was on camera. Every word she utters can be heard by the game makers. There is absolutely no secret she could keep. And Katniss did not let that slow her down, she simply used that to her advantage. When she knows the Capitol knows her every move she simply focused on better execution. Entrepreneurial Wisdom: As a founder you may be too secretive about your startup, product and technology. I am perplexed by those asking me to sign Non-Disclosure Agreements just to have coffee with me. Get over it. Ideas are worth nothing and everyone like you has similar ideas. It is all about execution. If you execute faster and better than your competitors, like Katniss did to her fellow players in the arena, you will live to tell the story. There you have it, five incredible startup lessons and entrepreneurial wisdom from Katniss Everdeen. Here is a bonus lesson: Don’t have names with two many vowels like Peeta. If you liked this article you will also like, “Three Winning Entrepreneurial Lessons from Heats“. I usually would wait till the end to say this is a parody. It appears however, either because my humor is not so good or I am getting so good at deadpanning, the articles seem real and serious to some. So I warn you, this is a parody (or a weak attempt at it). I have read the Hunger Games book series, was intrigued by possibilities part-1 offered, disappointed by part-2 and outright insulted by part-3. I did not see #CatchingFire or plan to. If the article seems serious it is because I am going to model this after a very serious one published in Forbes. You have seen my attempt to analyze data provided by a VC firm on how they decide to invest in startups. Contrary to what they thought they were doing there was just one factor that decided investment decision. Do VCs make informed evidence based decisions by meticulously rating startups like the data we saw led us to believe? That requires a meta analysis across all VC firms and someone just did that. … it has become conventional wisdom, accepted by all the parties ranging from entrepreneurs to those who provide them financing, that a high rate of failure is an inevitable consequence of doing new things, inventing new technologies, and opening up new markets—activities which are inherently risky and uncertain because they involve doing things that have not been successfully done before. Because this conventional wisdom suggests that a high failure rate is inevitable, there is often little effort expended trying to improve decision-making in new venture activity. Many of the VC firms do what they do without much introspection or reflection, partly as a result of the egos and self-confidence of the VC partners. People who have survived and prospered in the venture industry have obviously done well, and those VC’s who don’t do well generally don’t last. Therefore, it is axiomatic that most fund managers (those who survived and prospered) believe they are much above average in their abilities and in their decision making. Positive qualities get attributed to the people, groups, or companies that enjoy those good outcomes whether or not these qualities are true or causal. This means that high-performing VC’s will be perceived as having individual skill as a consequence of their performance, whether or not such skill actually exists. Entrepreneurs, too, mostly have strong egos, which is what is required to take on something new where the risks of failure are high. But this overconfidence among entrepreneurs and those that back them makes it difficult for people involved in creating new businesses to question things and to learn from setbacks and other experience. Most venture capitalists and entrepreneurs believe that outstanding individual people make the difference, leading them to focus on finding and recruiting stars and to eschew much attention to process, including decision making processes. 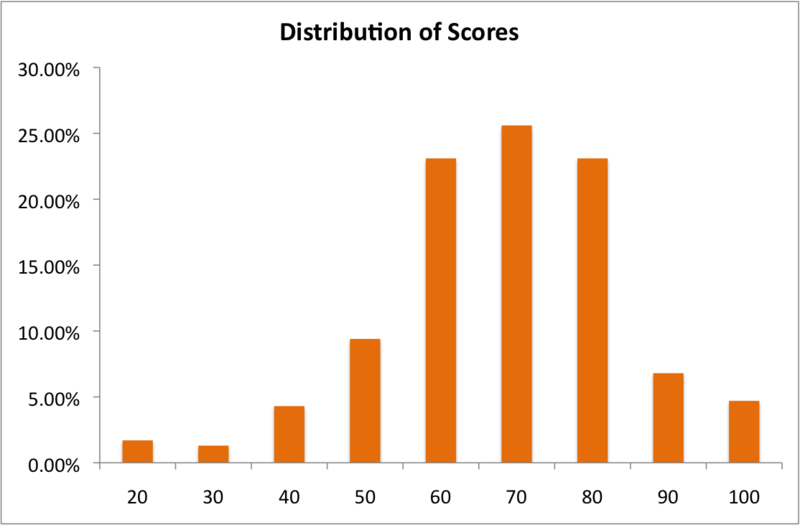 In my last article I presented the results of the startup investment decision quiz. When you look at the final score it would appear very few, about 4.7%, got it 100% right. That is their investment decisions are exactly same as that of the VCs’. Let us look at it another way, say instead of you making the decision in isolation what if you are able to change your decision after seeing how the majority decided. That is make a choice, so will many others without seeing or discussing with each other. Then you get to keep or change your choice based on the wisdom of the crowd. Since the crowd here is diverse enough with different background and experience it is reasonable to assume the crowd does not suffer from groupthink. Let us assume simple majority rule, >50% wins. Now how does the wisdom of the crowd (of 234) compare to that of one VC firm? Here is the summary of the results with the table showing percentage of YES and NO decisions by the crowd and the VC’s decision for comparison. Not all that bad now, comparing the wisdom of the crowd with that of the VCs. The two startups that got the termsheet from the VCs got one from the crowd as well. The crowd made the same positive decisions. And on the rest of startups the crowd decided to give termsheet to two additional startups the VCs passed on. While the crowd did not miss on opportunities it was little more lenient in saying yes. If these two startups really are duds (so to speak) the crowd’s decisions will be called “false positives”. If these results scale over large number that is twice as many startups that will get funding when they shouldn’t. Look at it this way, when there is unlimited funding to go around (with many VC firms, angels and others with unlimited money that fancy themselves as one) and unlimited number of startups pitching their venture (everyone is a founder), there are bound to be many false positives. And that is not all good. It is just frothy. How well will you do as a VC? A few months back I gave you a quiz, asking you to imagine yourself as a VC and make investment decisions. 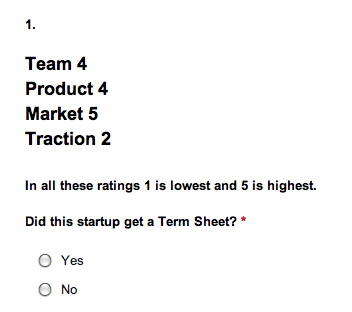 Here are the four metrics one VC firm used to rate the startups that pitch to them for funding. I took a random sample of 10 from their large data set and presented it as a quiz, asking you to use their metrics and make a call whether or not the startup got funding. No surprise here to find a Normal curve. But a closer look will reveal a longer left tail. But do not despair if you scored lower score. That does not mean anything about your performance as VC but only an indication of how close do you think to a particular VC firm’s thesis. You must keep in mind that I gave you the four metrics one VC used , gave their respective ratings and asked you to say whether or not the startup got funding. Who says those are the four right metrics? Or the ratings are correct? Or their method is right? Stay tuned for results on which one of the four factors most thought would be the reason to fund that startup. Not content with teaching entrepreneurial lessons from everyday events, Forbes also wants to tell us about places where one cannot learn entrepreneurial skills. The obvious target is business schools. Any article you write that puts down formal college education (dropout and start a company already) or business schools (seriously? don’t you know you can’t start a company with spreadsheets?) is about garnering millions of page views. And the audience is only more than willing. Gasp! What a waste of tuition and opportunity cost of two years! All those GMAT, essays, two years of beer nights and $100K tuition and yet they don’t teach you coding. For one thing you know there are only tech startups and another coding is not a hireable skill. If one goes to business school to learn coding one’s reasoning and decision making need to be seriously questioned. Besides why the obsession with looking at everything through the lens of an App? There are other businesses you know? One of my classmates started a T-shirt company (MarineLayer) and another started a Cereals company (MojaMix) – while still at Haas. I am pretty sure both did not come to business school to learn how to code or coded for their startup. The point is not about giving two examples as proof. A business is not about writing code, making t-shirts or mixing cereals – it is about finding a customer segment with unmet need, offering them a compelling value proposition, doing it better than competition and getting your fair share of value you created for them. Business schools don’t tell you they teach you how to sell. They can only teach you about sales process, sales structures, sales enablement, sales incentives and how to hire the right people. If your startup has a product (you know the one customers want to pay for) then shouldn’t you be hiring sales people? If you want to learn how to cold call and how to close you might be better off going to one of those real estate workshops. You take stock of your venture, see what key skills are needed for it to be better everyday than the previous day, prioritize those skills based on the return on investment, hire people who bring those skills and add more value than they take away. In other words it is a resource optimization problem under constraints. And you learn about decision making, opportunity costs, resource optimization and organizational behavior in business schools. All you need to do is apply that in your hiring process. On the flip side, when you find a person you absolutely want to have on your team, you have to make a compelling and credible case with them on why it is more value for them to be with your venture than outside of it. That involves marketing, selective targeting, positioning and value communication. Once again these are other skills that you learn but need to apply in the context of hiring. If you went to business school to learn wrong skills, should you be starting a business at all? For most people in the valley – running startups, working for them or mentoring them to become insanely successful – the sequence is clear. There is no argument. Anyone who says otherwise simply doesn’t get it. Wouldn’t it help if we all understand and speak the same thing when we say Strategy, Product or Business Model? Here is a very simple definition for these terms. Not made up, not changed to fit present day mania. These are well established definitions for running any business. And those disrupting status quo to create frictionless something or the other are not exempt from these definitions. Strategy – Here is a simpler and relatable definition – Strategy is about making choices under constraints (and most times under uncertainty). Choosing the only option available to you (say going for 4th and 24 with 7 points down and 20 seconds on the clock) is not strategy. Choosing all options available because you are not resource constrained is not strategy. Strategy is making hard choice, under limited resources (there are only situations with limited resources) and the outcome is far from known. For a VC firm their strategy could be the type of ventures they even want to consider, be it the pedigree or market it plans to play in. For accelerators it would appear they could fund anything and everything from enterprise to social media startups but their choice is to limit investment choices based on the stage of the startup. 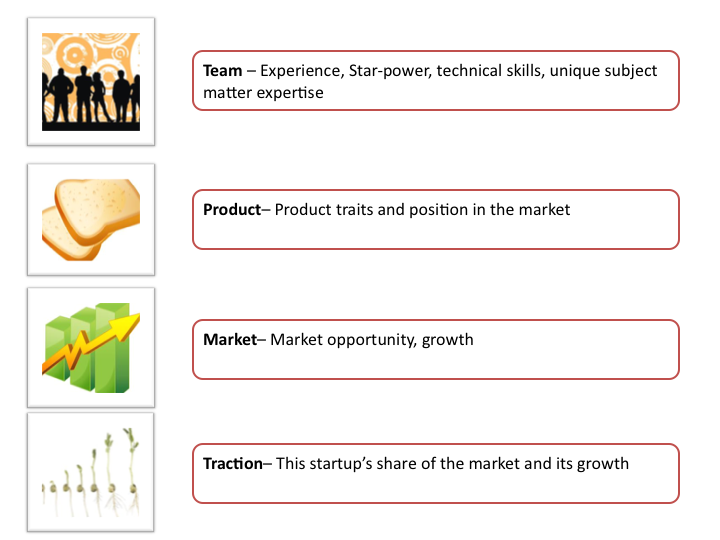 For a startup (or more generally, a business) the choices start with which customer segment and need they want to target first – a segment with compelling unaddressed need, that is not only big enough but also had big growth opportunity. You can serve all customers and all needs. The old adage about being all things to all people goes well here. For example, Salesforce.com choosing to serve enterprise customers with significant pain-points (and IT budget to spend) and reach them through highly effective direct sales team vs. building out Chatter as competition for Facebook is their strategy. Another example is Netflix choosing streaming over DVD by mail as the future. Strategy does not end with the first choice. If you have to make a hard choice among available options (and most times under uncertainty) then it is strategy. First it is the segment to target, then there are choices on routes to market, product, product features and when to deliver, pricing and communication. Together these two constitute your business model. You could be like some of the group buying sites and take a share of value you did not help create. Or you could be miss out getting your fair share. In either case your business will sooner or later will fail because it runs out of value to take or in latter case run out of cash. You could introduce a third party (or fourth, or fifth) in the value flow – say advertisers, content producers – and decide to capture value indirectly. If your product adds compelling net new value to customers you chose to serve, charging for it remains the simplest of all business models. And as an astute reader you noticed there are choices to make in defining the business model. It could be in how best to deliver value or how to capture value, whether to capture value upfront or align with value deliver (subscription). That is strategy does not go away when you move to business model. So we could say product is the value delivery medium. This is not to trivialize it. Product offers the greatest opportunity to innovate – to deliver something that does the ‘job’ better than any other alternatives available to customers, to deliver most natural way to use it, to do so in the most cost effective way for the venture that is building the product, to make it sticky, etc. Again there are choices to make – what to build, when, how etc. More strategy in building the right product. Given these, you decide whether one is greater than the other. For startups, Fred Wilson argues finding the product-market fit first, deciding on strategy then business model. The argument for product first approach should not be because of what we know to be successful startups or because of one’s inability to start with strategy first. Did you consider the possibility that when you do thousands of experiments – thousands of founders with the same personal problem, trying to address it in thousands of different ways – some experiments are going to succeed?